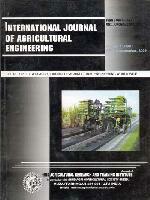 International Journal of Agricultural Engineering is an official publication of the HAS. It features the original research in all branches of Agricultural Engineering and other cognate branches of sufficient relevance. The journal publishes three types of articles. i.e. Review/Strategy/Case Study (exclusively by invitation from the personalities of eminence) Research paper and Research Note. The manuscripts should be submitted in triplicate with CD completed in all respect to the Editor, International Journal of Agricultural Engineering, 418/4 Numaish Camp, Muzaffarnagar-251001 (U.P.) INDIA. To facilitate an editorial decision on the acceptability, or otherwise, of their manuscript, and to speed-up subsequent publication, authors are strongly advised to consult the format of papers in a recent issue of the journal. Manuscripts should conform to the S.I. system for numerical data and data should be subjected to appropriate statistical analysis. On receipt of an article at the Editorial Office, an acknowledgement letter with a number is sent to the corresponding author. This number should be quoted or reproduced while making any enquiry about its status. ALL THE AUTHORS OF THE ARTICLE / PAPER MUST BE THE SUBSCRIBER OF THE JOURNAL.